I found this site a few days ago and have been reading a lot of your posts. I really have no words to adequately describe the depth my grief at the lost of my baby Lee Lee. She was a little angel dog that I found thrown out on the road when she was about 5 weeks old.... She was my heart. She died March 8th. My life revolved around her and I am totally lost. She was rarely apart from me. I was fortunate to be able to bring her to my work every day. I took her practically everywhere I went except to church. I am 50 years old and had no children except for Lee Lee. My husband is a dear but he seems to have moved on (or he is a pretty good actor). I think of her constantly, I can't concentrate at work, I can't sleep unless I take something, I can't eat - I've lost 30+ pounds, everything, everywhere is a reminder of my loss. I cry every day - I'm a mess. I do have some good friends who seem to understand what I'm going thru - but they all have human children and I feel they tire of listening to me. My church family offers no support at all. My family doesn't "get it" either. I did not realize that there were so many other people who have loved and lost like me. I am truly sorry for you all. I just miss my baby so much. Can't seem to get past all that she went thru in her life and last few days. I try to remember all the good times but the bad times seem to get in the way. My heart is broken. Sorry for rambling - Thanks for listening. I am so sorry for your loss. It is hard but coming here and reading everyones posts helps. I do not post that much but come often. It has been 13 weeks since I had to let my little dog go and some days are better than others. Talk about your friend here and keep reading. You're not rambling. You're heartbroken and devastated. I am so very sorry for your loss of LeeLee. This is truly a desperate feeling, isn't it? LeeLee was no less your child than a human one because she brought out all the maternal instinct you ever had. Just like my little Fiona did in me. LeeLee may not have been human, but YOU are so you grieve this loss like any human grieves the loss of a relationship that's so important to your identity, your sense of what is 'normal', and your ability to connect to a life where you share and care for someone so deeply. The bad memories of how she passed away do initially wipe out all of the memories of the good years you had with her. This, unfortunately, is exactly what happens. But I promise you with all my heart that this will change, eventually. Instead of thinking about what it has been like to lose her you will begin to feel again what is was like to HAVE her. LeeLee did not exist to leave you with a legacy of pain and sorrow. She will fight for a place in your mind that is filled with the beauty and joy of the relationship you shared. But it takes what it takes to get through this terrible shock and grief. It's not easy, and it's so painfully slow. My heart breaks for you. All of us here understand, we get it, and we care. Human or not, LeeLee existed, she MATTERED, and she was so very important. The truth is that she always will be. The quality of loss is not something that humans only feel for other humans - and LeeLee deserves every tear you shed, and every physical pain you feel. Please share the compassion and love you have for her with yourself, and do not let her loss defeat you. I am thinking of you. I'm so very sorry to hear you lost your LeeLee. People who have never had the type of connection we have had with our animals don't understand the pain we go through when we lose them. This forum is a wonderful place to express your feelings about your animal companions where everyone understands how you feel and knows how deeply we can bond with our pets. They were so much a part of our daily life and we grieve their loss just like any other lost relationship. I think about my Boo cat everyday but am now able to smile through the sadness when memories come up. How amazing that you rescued Lee Lee from abandonment like that. She was the world's luckiest dog to find such a wonderful mother. How long was she with you? I found it a comfort to write about dear Spike and Tike and the characters they were, even if I was crying buckets at the keyboard. Can you tell us more about Lee Lee? I do know what you mean about even your dearest friends not completely understanding. Even kind, lovely people will say 'Oh that's sad.' and move on to something else. Animal lovers who've been through the devastation - perhaps several times - will give you a big hug and shed tears with you. If only there was a way through the torture of love and loss. But after three months of being an emotional wreck I have found that being among friends here has started the healing. Big hug and shared tears. I am very sorry for the loss of your loving companion, Lee Lee. You have come to the right place for support and comfort. Losing a pet that means the world to you is a very hard loss to accept. For many, the grieving is endless. When my bunny passed almost five years ago, I never thought I would find peace in my heart. Coming here and sharing with others did start me on the road to recovery. Sharing stories about your pet is also a good way to keep their spirit alive. I wrote letters to my boy for the first year of grieving and that helped. Everyone here understands what you're going through and will be here for you. My thoughts and prayers are with you. I stopped in for a minute to read the posts. Thank you soooo much every one for your kind words. I will be back later, perhaps tonight to write more. I'm so sorry for your loss and that you are feeling like the pain will never ease. Reading everyones stories and trying to give a little relief to them has helped me a little every day. It seems like everyone who comes here has a common thread of loving and having a ahard time getting past the grief. It definatley helps to be part of a larger group that has similar feelings to you. Keep coming here and hopefully the good memories will slowly start to overtake the bad ones. I hope you find some peace. Again Thank You to everyone that replied. I went to each of your sites and read your stories and looked at the photo albums of your beautiful babies. My heart goes out to each of you and your terrible losses. I'm so glad I found this site. I thought I was the only one that felt like I do but now I know that I am not alone in my grief. I want to tell you a little about my Lee Lee ... I miss her so. (I have a couple of pictures posted. - but I can't figure out how to attach one to this) My Baby Doll was with me 8 1/2 years short years. She loved walks - we walked almost everyday in our subdivision. There is a lake and she loved to go there. She loved riding in the car even if was to go to work each day. She just loved to ride. (mostly in the front seat with her Daddy - I rode in the back seat). Sometimes we would just ride her around the lake for no reason other than she loved it so. She loved to get "pretties" for us. It might be a toy or a piece of paper - anything she could find to priss around with and have us make a big deal over and tell her how beautiful it was. She loved to wiggle in the grass. Almost every when we got home from work she would wiggle/slide down the hill behind our house on her back - legs up in the air. She loved to play with my other dogs - there are only 6 left now. JaeJae my oldest left us about a month after Lee Lee. She was about 15yrs old. She loved to have her back scratched - she would back up to anyone who was willing to scratch and stay there til they got tired. She loved to lay out in the sun and "bake". We chose one of her favorite spots in our back yard near a live oak tree as her final resting place. I think she would approve. But mostly she loved her people. She was never ours - we were hers - always will be. I never thought she would have to leave so soon - it just doesn't seem fair. I don't know why she had to have so much trouble when others are allowed to live long lives. No answers in this life. I don't know what to do with myself - all my days were spent doing things with her and for her. The void in my life is almost to much to bear. I wait for the time that I'll see her again. I miss her happy smile. I miss her "sugar spot". I miss her smell - she smelled so good. I miss her feet - I loved her little feet. She was so smart - I talked to her all the time. I miss her presence. I miss you so very much My Little Angel. Lee Lee is so beautiful and I love the pictures of her. What a loss for you and I am so sorry. The pain of grief is so dark and empty. We just need to get through it day by day. I think Ty and Lee Lee must be friends already. My Lee Lee also ate from a fork, she loved to chase squirrels and bunnies (we had to call then S.Q. 's and B. 's - she knew the words) and going for long walks(W's) was one of her favorite things to do. We walked many, many miles. I had a complete breakdown today - at work - I just could not get a grip. I believe they probably think I'm crazy(even though they don't say anything). Maybe they are right. It is so hard sometimes to "hold it together". I feel like I exist on the very edge of hysteria most of the time now - in a nightmare I can't escape. Wednesday was the day of her surgery. Every day of the week has some horrible, heartbreaking memory attached to it. You've been gone 77 very long, lonely days. I miss you more than mere words can express. Last night I went into the room where your things are (I can not bear to see them every day) and picked up one of your blankets - it still carries your scent. It stabbed me in the heart. You had your own special smell - kind of like a mixture of fresh grass hay and the way the earth smells after a cleansing rain. People used to say "she smells so good". It was all you - you bathed your self daily. You could be filthy dirty from playing outside and within a little while you'd be clean again. Your white was so white. I miss you so very much my little Baby Doll. I miss your "belly spots". I miss your precious little feet (I treasure the paw print they gave me). I miss all the little things no one else knew about. Life is so empty without your sweet presence. I'd give all that I own to have you back - but that is not possible. I wait for the day I'll see you again, ears all slicked back, smiling with pure joy. p.s. - Have you found Jae yet? My Angel Lee Lee with a "pretty"
Your baby was so, so precious. I fell in love with her, just from her pictures and your description. She looked like she had a lot of "puppy" in her, even as she aged. You're not crazy. Sometimes the people that are close to us, just don't understand the grief and longing unless they have gone through it themselves and sometimes, not even then. She was your heart and your world and you deserve to feel her loss in it's entirety. Know that you're not alone and come here for all the comfort that you need. I am so sorry that you lost your angel so early. You're right, it isn't fair. Hugs to you and kisses to Lee Lee. Thank you so much for your kind words for my Lee Lee - life is so empty without her. It is sad to me that some people try to diminish love because the recipient has fur, four legs - or is different in some other way from us humans. She is still my baby - not just a dog. I'm glad there are people who understand - just as you do. I know you are grieving for your precious babies Zoe & Oscar also. I hope to have the courage to tell my Lee Lee's story one day. I am thinking of you and Thank You again. He is absolutely beautiful! What a great looking animal. I love the picture of him chasing the squirrel. Thank you for your kind words for my Lee Lee when you are grieving your own loss of Titus. Our circumstances are different - but the love is the same. Just wanted to send you hugs I know I am totally heartbroken myself in my loss of Hannah love the pics of your angel. I know our babies went to the rainbow bridge the same day and they are keeping each other company chasing squirrels. I am trying to remember all the great times and things Hannah did with our family she made our family complete and is deeply missed by all. Hold on to all your great memories of Lee Lee. Know you made him happy and gave him a great home with lots of love that is why we hurt so much we give a part of ourselves to these beauties and they are part of our families. Please know that you certainly aren't rambling...this is a very difficult situation that you find yourself in. I was reading your post, and I am in almost in the same situation. I lost my dog six months ago, and I still cry every day, no one understands, and my husband also, seems to have "moved on," and never mentions Bailey. We had him only for 7 yrs. I know how close you were to your pet, as I was to mine. There is this unconditional love that a pet gives you, no questions asked, is always there for you, no matter the situation. Family certainly doesn't understand, that is why I am so glad I found this site to vent my emotions. I am so sorry for you, and I won't say time will help, because so far it hasn't with me. I wish you peace. Sorry to read of your still very recent loss. It is so hard to lose a pet who gives us unconditional love. I have had to say good by to so many over the years and it seems each one becomes harder something I put down to our age. I think your right about your husband being a pretty good actor since men tend to deal with their grief differently. You might consider a one on one bear your soul session with him. I have found that this can allow both to vent all their frustrations and grief. May you soon be able to smile and laugh at all the good times as the pain of your grief eases and your heart heals. Thank you so much for taking the time to respond for my angel Lee Lee. I miss her so very much - at such a deep level that I guess I feel my thoughts are kind of scattered. She was my child - I treated her as such. It is just so hard. My heart hurts so much. But of course, sadly, you know how hard it is because of your dear Bailey. I pray we both can find some peace soon. I am so thankful that Sadie Mae looks better. I am praying that she continues to improve and you have her home with you soon. It broke my heart to read your post - It took me straight back to my Lee Lee's last days when I begged everyone I knew to pray for her - God had other plans for my Angel though. I hope with all my heart that your Sadie gets better. Thank you so much for taking the time with all you are going thru to read about my baby. Melanie...how are you doing today so far? I find there are many times in the day that I miss Bailey beyond words. Bailey had diabetes since last October and had to have two injections a day, my son is living with us for the moment, and he would always help me distract Bailey, it was hard to do these shots. So at 7am and 6:30 pm, it was time for his shots. Bailey required a lot of my time, he had surgery for 14 bladder stones two years ago, and had to wear a doggie belly band with a pad in there, as I don't know if he was just in a bad habit of peeing, because of the stones, but I had to take him out so many times during the day. I was in a routine, and suddenly, that routine is no longer in my life, Bailey was a wonderful dog, as I am sure Lee Lee was. I don't know how to get past this. Every day is still hard for me six months later. All I can tell you, don't be hard on yourself. As you can read from the many posts here, a lot of people are still struggling. I thought I was the only one who was taking so long with my grieving for my dog, but it isn't so...I was starting to think I was going over the deep end or something. This made me feel better about things mentally. Everyone grieves in their own time, some people can move on quickly, while people like us, it is taking a lot longer. Be kind to yourself. You know there are many people in your life who cannot understand what is taking you so long to get over this...after all he was "just a dog", well, he wasn't to you and Bailey was like a child to me, too. I didn't have Bailey as long as you had Lee Lee, but it doesn't matter, they leave such an imprint on your soul. I think of Bailey the last thing at night and the first thing in the morning, and a lot during the daytime, so it is still raw. I hope you have a little better day today, but if not, that is okay too. back and be able to cuddle his soft body once again. And look into his golden eyes. I have never experienced such pain before, now I do know the feeling of a true broken heart. Its so hard Melanie I feel for you but remember you must take care of yourself too. LOVE the photo of her outside. She looks like she was flying! Love the others too but that's a great action shot! Hope you are well today. I understand exactly what you mean about the times of day and the routines we used to have with our babies Lee Lee and Bailey. It is difficult for me to know what to do with all that time that was spent with her (she got meds daily also). It is like you have to restructure your whole life and that is hard to do. I am better right now, but last night - not so much. The night did have a bright spot though - I received a sign from my angel - at least that's how I explain it...it brought me some peace. That movie Ghost is one of my favorites. It was on not too long ago here but I couldn't watch it - it is so beautiful but so sad at the same time, it always makes me cry. I do KNOW that our babies are OK, they are happy, whole and enjoying heaven until we meet them again. I have received assurance about that, it is just the waiting...it is so hard. I understand how you miss looking into Beau's eyes - Lee Lee's eyes seemed to look into my very soul - and that is so hard to give up. Thank You supes414, That photo is one of my favorites - she sure didn't like any squirrels in HER yard. She was quite a little ham. Wishing you a good day as well. You are absolutely right, the weekends are the worst. During the week at my office she slept under my desk all day (except for a walk before work, and at lunch) while I was working. I miss her being there - but I'm a manager and my days are extremely busy most of the time so I do have that distraction. But the weekends at home she considered "her time". Lee Lee loved the outdoors and we would be outside most of the time - it is a lonely time for me. But I'm sure she is enjoying herself in heaven - she never has to go inside if she doesn't want to. Maybe she and Bailey are laying in the sun together - did he enjoy that? And what about you my friend - how are you today? I can't imagine how I will feel when she has been gone as long as your Bailey. Melanie...I totally forgot that LeeLee went to work with you, too. ..gosh, that has to be difficult for you not having here there to spend your day with you, what a void that is. I am retired, so they say, and my days were here with Bailey 24/7, plus, all the care he needed etc. I am still "lost" and I don't see it getting better anytime soon, either. I think this was really difficult for me this time, too, because I am so much older now then when I had my other two dogs, and the way it happened, I can't seem to get those images out of my thoughts. I know that Bailey most likely is my last dog, and I couldn't even imagine going through what happened again, it made me physically ill. When I went for my physical a couple of months ago, I told the doctor how upset I was, she told me to put it behind me....you have to be kidding me! Guess she doesn't own a dog or pet of any kind. There are times of the day, when the mailman comes, for one example, Bailey would bark his head off at him, sit at the top of the steps and bark, now, it is so quiet here. Bailey would go into his doggie crate when I had to go out, all I had to do was put the stereo on, and when he heard me put the stereo on, he would go right in his crate,get a treat, it was really funny, he loved to listen to music...it seemed to calm him. Now, I haven't had that stereo on since he died, can't do it. Bailey would jump up on the chair in the living room when the music was on and take a nap...too. The first few days after he wasn't here, I thought I heard his tags on his collar, they would always jingle. I would come home, and he wasn't there getting so excited to see me, now no one gets excited! Bailey would come in from outside, and run into my son's room, and if my son was home, he would get so excited like he wasn't here for days. I will be okay for awhile, and then I see a dog commercial on tv, and that always makes me start crying. I can't see another Bichon without crying so I know that I am hardly past the grieving stage. My husband still works, so he isn't here all day long, so I guess it was different for him, I don't know, but not to mention Bailey, is very difficult. I have my son here, so we talk about Bailey, and that helps, and he gets as upset as me when he sees a Bichon when he is out. So, I take one day at a time, see how it goes, some days are worse then others as you know, things will just hit you out of the blue, or the way you see another dog move, it reminds you that Lee Lee or Bailey used to do that too. Take care of yourself, Melanie. I will be on here to check on everyone. LeeLee's Mama -- I am so sorry, and I know exactly how you feel, truly. Our Daisy left us only two days ago; I had to make the decision to free her from pain and illness. She was 14 and we'd had her for 13 years. I saw the pic of LeeLee and she was beautiful! Her face lit up with such a smile. 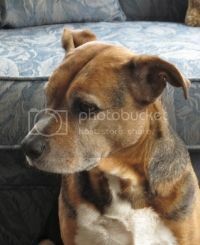 Daisy was a mixed breed, too -- pitbull and beagle. It was a wonderful combination for a pet. I'll see if I can attach a pic so you can see how dear our girl was. I will say a prayer for your healing. LeeLee will never, ever be replaced in your heart. Someday, if you could provide a home for another rescued pet, that would be great. All of our dogs have come from high-kill city shelters, and I swear they know they owe their lives to us... such loyal and adoring souls. Your Bailey sounds like quite a character (Lee Lee barked at the mail-man too) and so smart, so full of love - just pure love. I understand how empty your home is now. It is hard not to look for them in every corner. Music gets to me also - I can't listen right now - seems like every song has a reminder somewhere in the lines. And those commercials ... they get to me too. It is just so hard without our babies. I have been writing down all the memories I have of Lee Lee - big and little (even the ones that seem so silly) - I have been surprised how many there are. I want to put them in a book one day. I will be thinking of you and I will continue to pray that you find some peace in your heart. This ((((((BIG HUG)))))) is for you my friend. Thank you so much for responding for my Lee Lee when your own loss is so close and fresh. I am so very sorry about your loss of little Daisy, she is just precious in that photo you posted - I just want to squeeze her. I love her name, Daisy was my Grandmother's name - she was a short, round lady that always had a kind word and a smile for everyone. I read your Daisy's story, your life must be terribly empty after having that sweet angel with you for 13 wonderful years. It is almost unbearable when they are gone. Mama misses you and loves you so very much.